Crank up the gravity and put your head safely in a jar! 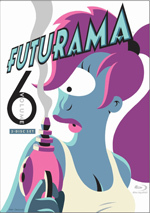 It's Volume Seven of Futurama - the animated sci-fi comedy from The Simpsons creator Matt Groening. Crammed with a whole new dimension of extras not shown on TV, this cosmic collection includes 13 bizarre and brilliant episodes involving ancient prophecies, Presidents' heads, robot gangsters, angry butterflies, and of course, sausage-making. It's a shipload of futuristic fun! 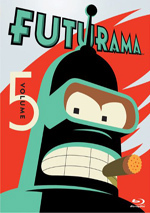 After cancellation and some direct-to-video movies, Futurama returned to episodic TV in 2010. This DVD gets us to the third season of that run, and we get all 13 of those programs in this two-disc set. I’ll look at the shows in the order presented here – this appears to follow production order, not airdate. The plot synopses come straight from the menus. The Bots and the Bees (aired June 20, 2012): “Bender fathers a child with the office soda machine.” Volume 7 launches quite well with the funny – and almost emotional – “Bees”. Bender-based shows tend to be strong, but they’re not usually sentimental “Bees” pulls off both elements in a satisfying way. A Farewell to Arms (aired June 20, 2012): “An ancient prophecy predicts the world will end in the year 3012.” “Arms” offers a fun combination of 2012’s Mayan predictions and Deep Impact. It benefits from some clever twists, most of which – bizarrely – involve Fry’s pants. Throw in Nixon’s head – always a winner – and this turns into a solid show. Decision 3012 (aired June 27, 2012): “Leela becomes campaign manager for a presidential candidate whose birth certificate is mysteriously missing.” Another episode topical for 2012, the whole birth certificate thing feels a bit trite. However, it’s delightful to see Bender and Nixon combine for foul play. Those moments – including an odd but hilarious moment in which Nixon roots for a squirrel to fall off a wire – add up to create a consistently amusing episode. The Thief of Baghead (aired July 4, 2012): “Bender joins the paparazzi and attempts to photograph a famous actor whose face has never been seen.” After a good string of shows, “Baghead” feels less than enthralling. Oh, it has some fun moments, but it comes with a flimsy premise and a lackluster arc. It’s not bad, but it only becomes “okay”. Zapp Dingbat (aired July 11, 2012): “Leela is horrified when her mother begins dating Zapp Brannigan.” Zapp has never been as interesting a character as I would’ve liked, and Leela can be a whiny bore. Combine those two with a flat story and “Dingbat” falls short of greatness – or even “pretty goodness”. Like “Baghead”, it offers some amusement but it doesn’t seem better than average. The Butterjunk Effect (aired July 18, 2012): “Amy and Leela become addicted to "Nectar", a nutritional supplement that boosts their performance in the future sport of Butterfly Derby.” “Effect” doesn’t always connect, but it has enough fun moments to make it work. Most of these come from some decidedly odd sequences, as “Effect” throws out more true weirdness than usual. It’s not one of the year’s best shows, but it’s pretty good. The Six Million Dollar Mon (aired July 18, 2012): “Fed up with his inferiority to machines, Hermes replaces his body parts with mighty mechanical upgrades.” Of all the main characters, Hermes probably stands as my least favorite, and nothing here changes that opinion. The show also uses Zoidberg a lot, and he’s another mediocre character. Due to the emphasis on those two, “Mon” ends up as the weakest program so far this year. Fun on a Bun (aired August 1, 2012): “Fry is the victim of a horrific sausage-making accident.” Now there’s a phrase you don’t hear every day: “horrific sausage-making accident”. “Bun” provides one of the year’s weirder episodes but also arguably its most satisfying, as it seems self-assured and funny. Free Will Hunting (aired August 8, 2012): “Bender embarks on a quest for the meaning of life after discovering that as a robot he lacks free will.” While not quite as good as “Bun”, “Hunting” still entertains. It moves at a terrific pace and gives us a strong mix of clever, kooky moments. Bender shows usually work well, and this one continues that trend. Near-Death Wish (aired August 15, 2012): “The Professor is deeply disturbed when his parents return from virtual retirement aboard the Near-Death Star.” After two strong episodes, “Wish” seems less than terrific. The Professor doesn’t tend to be one of the more interesting characters, and the show’s revelations aren’t all that delightful. This isn’t a bad program, but it’s not memorable either. Viva Mars Vegas (aired August 22, 2012): “The crew stages a casino heist to recover stolen property from the Robot Mafia.” On one hand, I’m not wild about Zoidberg-centric shows, but on the other, I love the Robot Mafia. But on the other other hand, we get a lot of Amy, another lackluster character. That tips this toward the mediocre side, though it’s still enjoyable enough, especially when it spoofs the Ocean’s series. 31st Century Fox (aired August 29, 2012): “After saving a robotic fox from hunters, Bender becomes the hunted.” Though Bender-based episodes are usually top-notch, “Fox” seems average. It throws in enough frantic silliness to amuse at times, but it’s not a consistent winner. Naturama (aired August 29, 2012): “Bender and the crew are reimagined as wild animals in a nature documentary.” This one creates an unusual twist, but not a wholly satisfying one. The use of the characters as critters can be fun, but none of the three segments really comes to life. It’s a clever episode but not a great one. 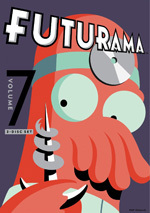 Futurama appears in an aspect ratio of approximately 1.78:1 on these single-sided, double-layered DVDs; the image has been enhanced for 16X9 TVs. Within the constraints of SD-DVD, the shows displayed excellent visuals. Sharpness seemed terrific. From start to finish, the programs offered solid delineation, with a consistently concise and tight presentation. I noticed no signs of jagged edges or shimmering, and edge enhancement was absent. Source flaws also failed to materialize in these clean transfers. While not particularly impressive, the Dolby Digital 5.1 soundtracks of Futurama were perfectly adequate. The shows offered a good sense of environment and used a few action scenes to open up matters in a decent way. Not a lot of these moments occurred, but they worked well when they did, and the general sense of setting satisfied. Audio quality was always very good. Speech sounded natural and warm, with good intelligibility and no defects. Music was lively and dynamic, and effects fell into the same realm. Those elements appeared concise and accurate through the flick. Nothing here dazzled, but the tracks seemed positive. Expect extras that echo those from earlier packages. All 13 episodes include audio commentaries. For these, executive producers Matt Groening and David X. Cohen, supervising director Peter Avanzino and actors Billy West and John DiMaggio chat on all of them. In addition, we hear from co-executive producers Eric Horsted (1, 10), Josh Weinstein (2, 3, 4, 12), Patric M. Verrone (3, 4, 5, 6, 11), Michael Rowe (7, 8, 9), Dan Vebber (7, 8, 9), directors Stephen Sandoval (1), Frank Marino (5, 12), Crystal Chesney-Thompson (6, 13), Raymie Muzquiz (9), Lance Kramer (10), and Edmund Fond (11), producers Lee Supercinski (1, 2, 3, 4, 7, 8, 9, 10, 11, 12) and Claudia Katz (4, 5, 6, 7, 8, 9, 10, 11, 12), writers Eric Rogers (5), Michael Saikin (13) and Neil Mukhopadhyay (13), and actors Maurice LaMarche (1, 2, 3, 4, 5, 6, 11, 12) and Lauren Tom (6). We also get a “Bonus Animator Commentary” for “A Farewell to Arms”. Alas, I rented these discs and forgot to make a tape of this one before I returned the set. As such, I can’t say anything about the track other than to note its existence! This means you should expect the same kind of material we found in the past, and I think that’s a good thing. I’ve always enjoyed the Futurama commentaries, probably more than the chats for The Simpsons, largely due to the fun that comes with the actors. Sure, West and DiMaggio can take things “off-topic” at times, but dadgummit, they’re a blast to hear. The commentaries move well and add value to the set. Both discs include collections of Deleted Scenes. Disc One’s run a total of six minutes, 56 seconds, while Disc Two’s go for six minutes, 34 seconds. They mix final animation with story reels; the latter show storyboards accompanied by audio. We get deleted scenes for 11 of the 13 shows: “The Bots and the Bees” (three scenes), “A Farewell to Arms” (two), “Decision 3012” (two), “The Thief of Baghead” (three), “The Butterjunk Effect” (two), “The Six Million Dollar Mon” (one), “Fun on a Bun” (three), “Free Will Hunting” (two), “31st Century Fox” (one), “Viva Mars Vegas” (two) and “Naturama” (two). Most of these offer short extensions to existing scenes. Probably the most substantial relates to Bender’s rap song from “Hunting”. That tune shows up in a semi-unrelated way at the aired episode’s end, but the deleted sequence shows how the program meant to use it. Nothing amazing shows up here, but the snippets tend to be amusing. Disc One also includes a featurette called Christopher Tyng’s Big Score. This lasts eight minutes, 25 seconds and shows the series’ composer at work. We find an enjoyable take on the music of Futurama. On Disc Two, we locate Mobius Trip. This delivers “infinite Futurama screen loops” and lets us view “aquarium” or “terrarium”. This act like virtual environments, though with a Futurama bent; for instance, as they show the altered characters from the “Naturama” episode. These are cute additions. Finally, Futurama Karaoke lets you “sing along with your favorite characters”. This area takes five songs from the series and allows you to croon along with or without vocals. It’s a fun extra. 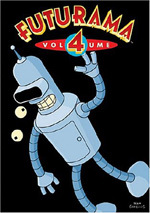 While not the best package of Futurama episodes, “Volume 7” still musters a lot of entertainment. The volume comes with ups and downs but nonetheless provides more laughs than groaners. The DVDs offer excellent visuals along with good audio and a pretty informative set of bonus materials. Fans will get a kick from this fun package.